Work from Nora Clemons-Gallo that I won ~ Exciting! Another day and here we are with Friday's post. The weeks just seem to fly by. The first photo (snow person) is another mini creation for a Holiday Fair. The second photo is Nora Clemens-Gallo's work (batik done on paper) that I won a few months ago and just received this week. Isn't it gorgeous? And the word 'Imagine' is a title of a favorite song of mine by John Lennon. 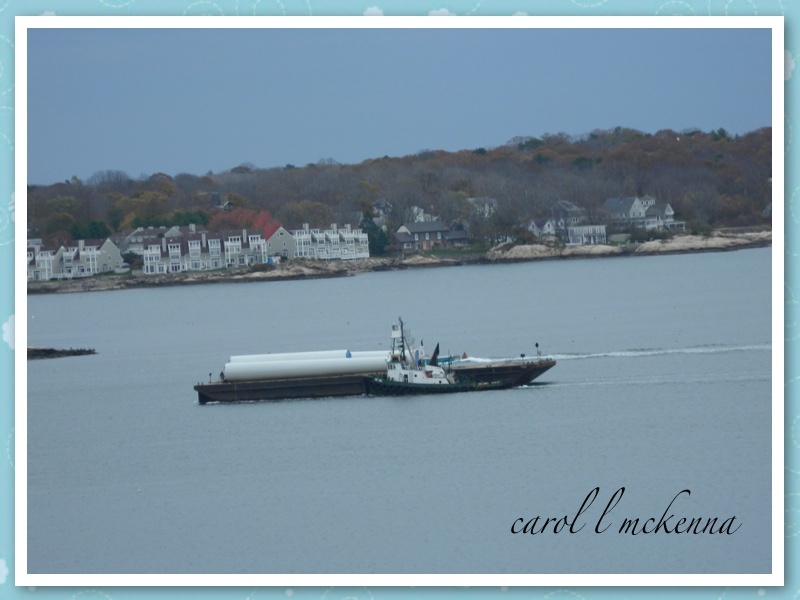 The third photo is of another favorite and that is of a tug boat doing what it does best 'pushing a larger boat' into harbor. Hope you will check out the wonderfully creative blogs listed above. Enjoy. 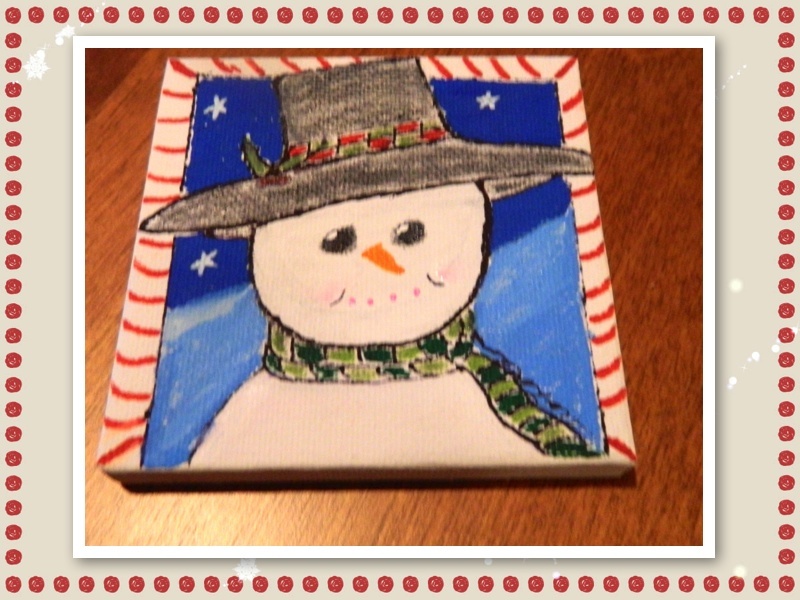 It's fun getting out some of the winter artwork and decor like your snowman painting. beautiful painting, such a great snow man and I love the Imagine painting, beautiful words as well!! Your snowman is so cute! I love that batik artwork as well. Congrats on the win! Quite the combination! Hope you make it safely through this latest strange weather! As always, I am inspired to drag out my supplies and get creative. So lovely. I love your creations ... lovely !!! Hi! nice Imagine sketch,Beautiful tug boat photo, Wonderful Haiku. Congrats on the win. What a treasure to win! That is an amazing piece! Happy PPF! Hmmmm. Seems to have eaten my first comment. Again - Excellent 'Ku. And thank you, so much, for joining in. yes, we are home from the warm heart of mexico. soulful memories suddenly greeted with winter storms. friendship, a welcome fire in the heart. We had lots of that raging storm in NJ - love the haiku. And what a lovely gift you won! The piece you won is stunning, and your snowman is so much fun. Happy PPF! Wow, you're really cleaning up a lot of memes with your post. I came for the Haiku My Heart but got so much more. I love the Imagine painting. Always a great thought and immediately makes me think of John Lennon's words of Peace and Love. Very nice overall. I adore your snowman, yet feel sad for those who are still without power and heat in the NY, NJ area. This has been the worst storm ever, with devastation on top of devastation. I love your haiku. I've only tried ONE and it was a bit of a bomb. Yours was great. BTW, thanks for dropping by and leaving such kind comments. This is the first time I have been able to leave a comment on your blog. Is blogger actually playing nicer? Hello sweet Carol, I have missed you! Love your offerings here this friday, the imagine piece is wonderful, one of my favorite songs as well. The grey weather in your haiku does in now way dappen the brightness of your sweet creative spirit! Much love to you! So many wonderful things here, beautiful creations! Love it all, your blog just oozes fun and serenity too. Happy PPF. Your artwork resonates so beautifully with me...today brings our first storm of the season...getting us all into the holiday mood! I always love visiting your blog ... give ArtMuse a nuzzle for me. The snow person is wonderful. I'd really rather now cope with snow just yet but you can't make snowmen (or ladies) without snow, can you? wonderful post as always carol...I hope you will join in creating the gratitude quilt:-) more info at the top of my blog. A wonderful post Carol. I love the haiku on violet. Thank you for sharing your creativity on Carpe Diem. I like both the snowman and the words Imagine and I too love that song by John Lennon! :) Yes the days are running, I so agree!! Your mini painting is adorable - the snowman has such a cute face. Lovely art work and haiku. Thank you for sharing. 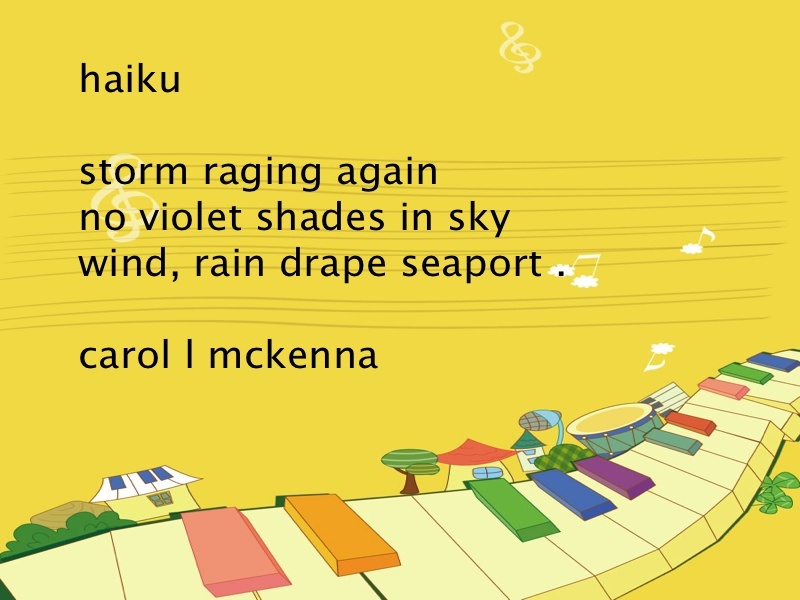 I need a bit of whimsy this week and I can surely relate to your storm haiku! I love your wonderful mini holiday painting!! I like your snowman and really enjoyed your Haiku! Happy PPF! Thanks. I love the imagine painting it is one of favourite songs too. what a wonderful bunch !!!! Another cute mini painting; the one from Nora that you won is very beautiful, congrats! Cute painting, and lovely haiku! Lucky you to receive a gift from Nora. It looks wonderful! Your snowman looks like a very nice, friendly one (unlike one in a book I read recently!). Beautiful painting of the snowman, and a great photo too! i the piece you won is beautiful! so is your mini painting. thanks for this creative post. Very nice painting! And nice image for Foto Friday, you do not have to match the theme! I'm happy you are here! Fabulous painting. Makes me even more excited for Christmas. Love your Yorkie too! Great Blog exciting beautiful paintings , always enjoy it. Cute snowman and a very timely haiku. and the prize you won in the giveaway is great. Your snowman is just adorable. I have a total weakness for snowmen (probably never got over Frosty melting at the end of the cartoon). And what a lucky woman you are to win that fabulous piece from Nora, it's wonderful. Your haiku gives me a vivid image of the storm! Enjoying all you posted here today! HPPF !